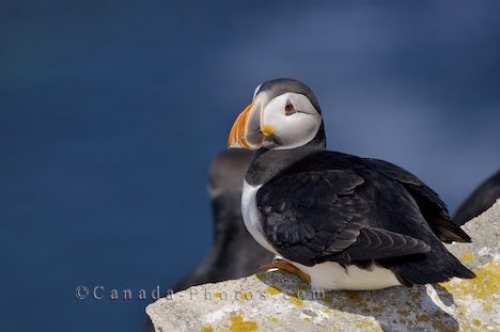 A cute Atlantic Puffin sits peacefully atop Bird Island overlooking Bonavista Bay in Newfoundland Labrador, Canada giving us an excellent opportunity to capture its picture. The large triangular bill is bright orange during breeding season with yellow rosettes decorating either side of its face at the base of the bill. Its face and underside is a greyish white color with the top of its head, back and wings being black. Its orange legs and feet are nestled underneath its body as this cute Atlantic Puffin rests on the sharp edge of a rock on Bird Island. Picture of a cute Atlantic Puffin at the nesting grounds on Bird Island in Newfoundland Labrador in Canada.